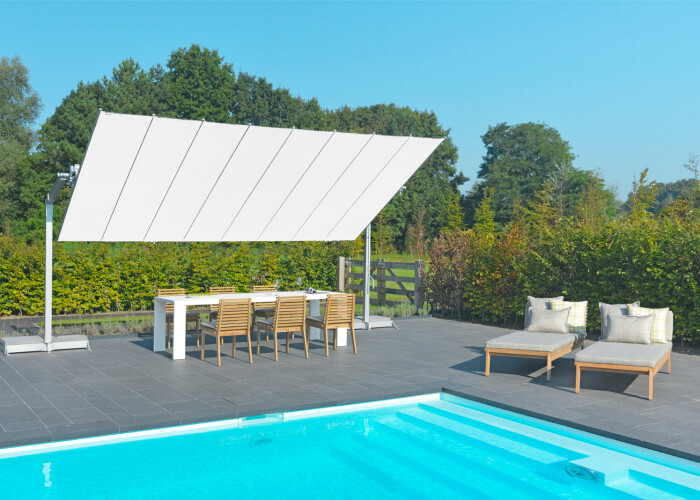 Borek’s sunshade, FLEXY, comes with a number of handy technical options and updates in 2014.Borek’s sunshade, FLEXY, comes with a number of handy technical options and updates in 2014. This entirely tiltable and luxuriously finished sunshade is now available with lighting and a completely automatic rolling system. The in-built anemometer closely monitors weather conditions, even when you’re not there. If it’s very windy, the FLEXY rolls itself up automatically. FLEXY is a king-sized 3.00 x 4.88 metres and can be finished in various colours, and can even be combined with your outdoor furniture. Other sizes and colours are available on request.